All of us here at the Jurassic Coast Trust are looking forward to Dippy’s arrival in Dorchester next February, and we’re thrilled to present A History of Dippy for you! 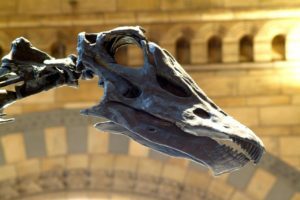 The skull of the Diplodocus. Dippy has become so iconic as a fossil specimen, it’s easy to forget that he was once a living dinosaur, some 150 million years ago. So what did he look like when he was alive, and where and how did he live? 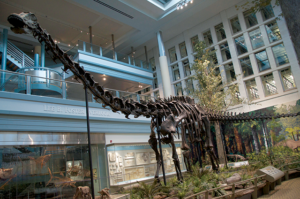 Dippy was once a living, breathing species of sauropod known as diplodocus carnegiei, and lived in what is now the western United States about 150 million years ago. 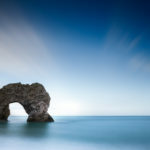 At the time, this was part of the northern super-continent Laurasia, which also contained our Jurassic Coast (though most of it was underwater!). Diplodocus as drawn by Go Jurassic! paleo-artist Peter Montgomery. Diplodocus lived for 70-80 years, similar to modern day elephants (and humans!). They were able to reproduce after about 10 years, but kept growing long after that, reaching lengths of up to 25 metres. They reproduced by digging shallow pits, laying their eggs, covering them with vegetation, and keeping a careful look-out whilst they incubated over 2-3 months. A baby diplodocus wasn’t enormous, weighing less than 5 kg (you probably could have picked one up!). But, once born, they grew FAST, gaining size at a rate far beyond that of any other creature on Earth, past or present. Due to their size, diplodocus would have been relatively untroubled by predators. A tyrannosaurus rex or allosaurus would much rather have picked on a raptor or hadrosaur than try to tackle one of these colossal creatures. If one of them did try to prey, perhaps on a young diplodocus, the other members of the herd would have used their whip-like tails to scare them off, as well as making all the noise a 16 tonne dinosaur can muster! There’s A History of Dippy, his life and environment. Believe it or not, the story of the discovery of his fossilised specimen is just as exciting! The Diplodocus dig site in the USA, and notebook from the trip. 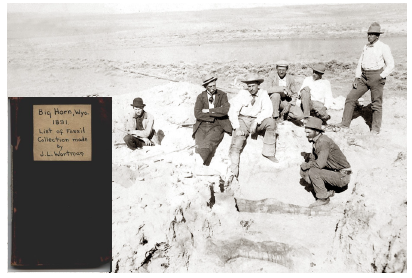 1899: The Scottish-American industrialist (someone who owns lots of factories) Andrew Carnegie finances a team of experts to go on a dinosaur hunt through the “Badlands” of Wyoming, USA. It’s tough work for the team, digging around in the dirt in rising temperatures, and travelling by horse-drawn wagon. To their shock and amazement, the team discover a nearly complete fossilised skeleton of a giant dinosaur, Diplodocus. 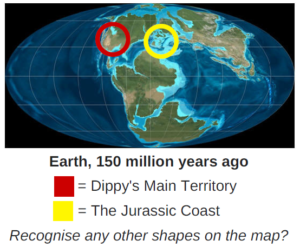 It’s found on 4th July, and is nicknamed “The Star Spangled Dinosaur”, and then “Dippy”. The original Dippy skeleton at Carnegie’s Museum in Pittsburgh, USA. The specimen is put together piece by piece, and becomes the star attraction at Carnegie’s new museum in Pittsburgh. 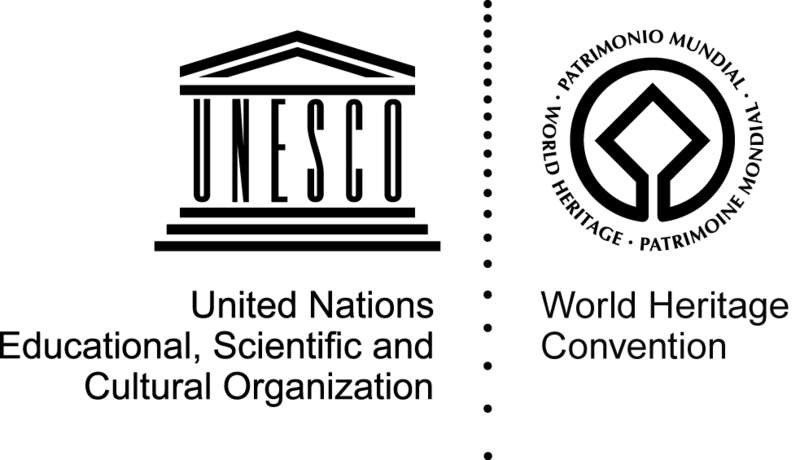 It’s put together by Arthur Coggeshall, one of the original excavation team, pioneering fossil extraction and specimen mounting techniques which are still in use today. 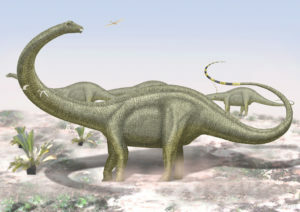 Upon its completion, scientists note that this skeleton is an entirely new species of Diplodocus, and name it Diplodocus carnegeii in honour of their patron. The Dippy sketch that caught the King’s eye. By good fortune, King Edward VII sees a sketch of the skeleton whilst visiting Carnegie at his castle in Scotland, and remarks that he’d like one for London’s Natural History Museum. Not one to dither, Carnegie promptly orders replica “Dippy’s” to be made, and sends them off to museums from Madrid to Buenos Aires. The sheer scale and majesty of these replicas bring palaeontology and enthusiasm for dinosaurs to the wider public for the first time. So…the hundred years we’ve enjoyed of Dippy in London, and the three months we’ll have of Dippy in Dorset, are only possible because the King popped in for a cup of tea! This is a re-production of two articles from the March & May 2017 issues of our Go Jurassic! Rangers newsletter. Sign up as a Ranger for exclusive Dippy on Tour offers!